The Congress won 21 seats in Meghalaya, 10 short of the halfway mark at 31. Results of elections were announced on Saturday. Shillong: With regional parties keeping everyone guessing after elections in Meghalaya threw up a hung assembly, the Congress met with Governor Ganga Prasad late last night, saying it should be invited to form government as the single largest party. "We told the Governor that we should be given the first shot at forming a government... There are clear guidelines in place that say single largest party should be called first," senior Congress leader Kamal Nath told NDTV today. Mr Nath and his colleague Ahmed Patel were rushed to state capital Shillong yesterday as results pointed towards a fractured verdict. The party won 21 seats, 10 short of the halfway mark at 31. "We are confident of coming up with the numbers and if we are invited, we will put that on the table," Mr Nath told NDTV. The party, however, has not produced letters of support to show that it has the numbers. The Congress has reason to worry. The BJP won two seats, but is rooting for an alliance of regional parties to keep the Congress at bay. Having drawn a blank in Tripura and Nagaland, the Congress is struggling to retain Meghalaya, which it has ruled for the last 10 years with Mukul Sangma at the helm. The party won 28 seats in the last assembly polls; it's down to 21 this time. 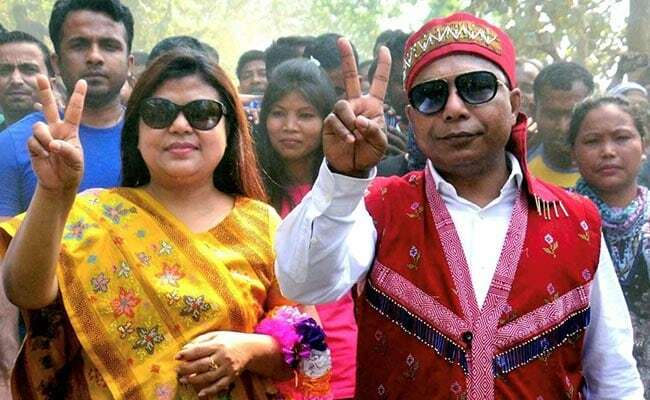 The National People's Party (NPP), founded by former Lok Sabha Speaker PA Sangma and now led by his son and lawmaker Conrad Sangma, came a close second at 19. The party, a part of the BJP-led National Democratic Alliance (NDA) at the centre, contested the assembly polls on its own. The United Democratic Party (UDP), which is a part of the BJP-led North East Democratic Alliance (NEDA), has won six seats. Another regional party HSPDP, which had a pre-poll alliance with the UDP, has won two seats. The BJP's northeast strategist Himanta Biswa Sarma - who has been camping in Shillong since yesterday - reportedly held meetings last night with Conrad Sangma and UDP chief Dr Donkupar Roy. The BJP has said that it will encourage regional parties to form government. Union ministers Kiren Rijiju and Alphons Kannanthanam, deputed by the party as observers for Meghalaya, met UDP leaders today. "BJP parliamentary board has sent me to communicate to the UDP that we are with them and we will support the formation of a non-congress government in Meghalaya," Mr Rijiju told NDTV. "We haven't decided who to support... have been in touch with both sides... not correct to say we are inclined towards the BJP," the UDP chief told NDTV earlier today, indicating that regional parties may play hard to get as the Congress and the BJP strive to cobble up numbers. In the event of the regional parties stitching up an alliance with the backing of the BJP, the support of three Independents would hold the key in government formation.